Mike Cullen (Twitter) is a young public servant who is also a regular contributor to (Cult)ure Magazine as a music editorialist. His passions include music, coffee, writing, travel and comic books. 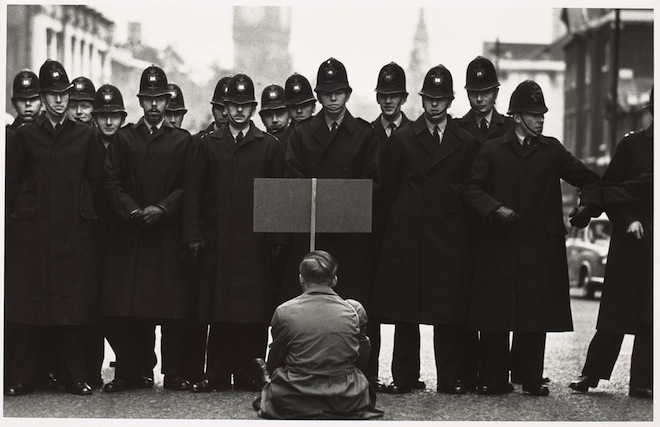 This special exhibition of U.K.-based photojournalist Don McCullin is his first ever solo exhibition, and its provocative imagery provides Ottawa and the National Gallery of Canada a unique opportunity to see a somewhat unknown photographer’s work shine to new audiences. McCullin’s work spans nearly six decades and a variety of environments; from war-torn Africa, to gangs in London, England to elephant festivals in India back to the Glastonbury area of the United Kingdom. His work is both stunning in its simplicity, yet thought-provoking in its content and context. US marine, Vietnam, February 1968. In recent years, McCullin has pulled himself away from photographing conflict zones, instead taking up landscape, travel and food photography, but regardless of his topic matter, his eye for composition and subject matter is something to truly experience. That National Gallery has been running this solo exhibition of over 130 photographs (all black and white) since February, and it closes April 14, 2013, so there is not much time left to take in these incredible works. For anyone interested in photography, journalism or world issues, this exhibition is a must see. Thanks Mike! Did you see the exhibit? What did you think?